Applied Broadband, an advanced software company, was looking for a new office in Boulder for their headquarters and base of operations. With few options in Boulder for new construction, they pursued a total gut and remodel of an existing 4600 sf building that had decent bones but needed a major transformation. The project had a fixed budget so the design team worked closely with the contractor throughout the process to ensure the design did not exceed the budget. The architect developed an approach of strategic intervention to create a fundamentally new experience of the building from within and without. This included a clearing out of the interior partitions, cutting a hole in the stair to make a 2-story space, transforming the stairs and creating important energy upgrades with new windows and insulation. New storefront on the south created a feeling of transparency and open-ness and highlighted the dramatic mountains views. Unique custom designed ceiling elements were implemented using digital fabrication techniques. On the outside, the open glazing created a new entry experience. This is heightened by a second floor deck and sunscreen. The building was unified with charcoal gray paint and stucco and highlighted with massive street numbers creating a new, dynamic identity for the building. 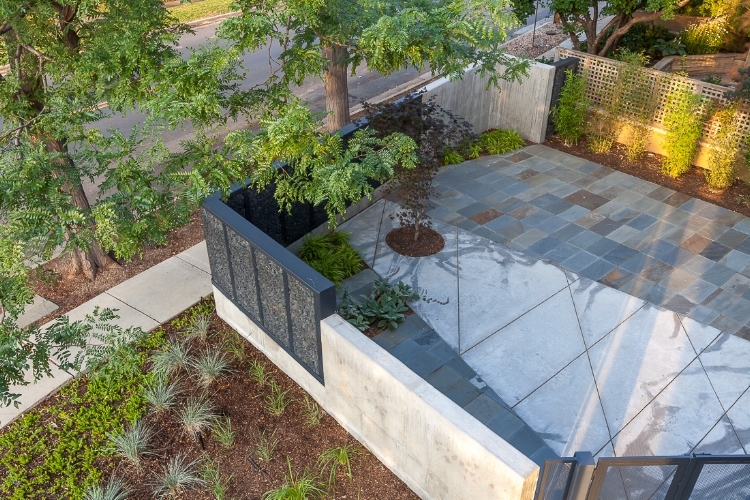 A courtyard was added at the front with concrete walls and a custom gabion system creating a private serene outside space that flows from the large conference room on the ground level. The project was a collaboration with Marcel deLange of 641 West Design.